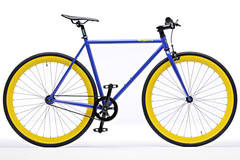 WEFIXIE Bicycles - Bringing you awesome Fixed Gear, Single Speed and Cyclocross bikes !!! This just in - WeFixie sells Frames! Yep - that's right, we are starting to kill it in the frame market with a super duper priced frameset that rides great and looks great as well. If you want - we can custom build it up for you, or you can build it up yourself however you want. Frame prices start at just $89. What, you say, yep, under a hundred for the black, celeste, gloss gray, gloss orange, gloss purple, gloss red, matte black, matte gray or matte pink. Isn't she pretty in pink! Just contact us and we can get you the sizing as well as any other information that you need! Here is one real deal - make that two if you count the guy behind the name - Greg Lemond - USA's only Tour Champ! So this bike is a USA made steel True Temper Frame - a Croix de Fer. It is built for someone approximately 6 foot tall, give or take and inch or two either way. We have it set up as a single speed, as it just fits this cool bike. It has a Surly chain tensioner, some nice Hutcheson tires on Mavic CXP rims and Bontrager hardgoods such as the bars, stem, seatpost and saddle. It has a little cross top brake lever laced to an Ultegra front stopper - way to hip! This is a cool one of a kind bike! We are now able to offer brand new uniquie fixies from Pure Fix Cycles. These are great bikes, look super cool and are brand spankin new. They have the ever so awesome steel is real ride and come in 3 sizes: 50cm, 54cm and 58cm, so a small medium and large. Pictured to the left is the Alpha and while it is sweet, there are other options available to impress everybody. Contact us for details on getting one of the sweet rides. They start at $325. We double dog dare you to find something as nice in this price range. WOW! We have several bikes that will be finished and posted as we get them in, so please check back and be the first to get a great ride !!! If you are interested in any of them - please feel free to email me at wefixie@hotmail.com and we will make sure you are on the list to see it first. Wefixie is working on some sweet custom new skoolers. Keep an eye out for them to be on their way as we hit the new year. 1. Kabuki = Bridgestone steel at its finest!!! 2. Vintage Italian Steel Merrelli - we are redoing it with Campy parts - it is a 54 cm bike.